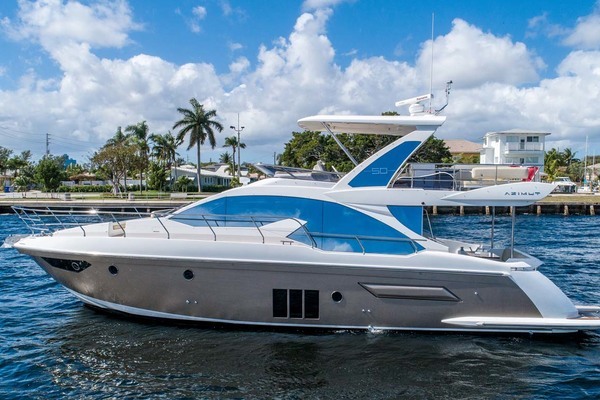 "JUST LISTED" 2016 Azimut 54 FLY new on the market. Has the new White Ash interior and shows very well. Custom décor package. Has Volvo D-11 engines with 265 hours as of 25 July 2018 with Xenta joystick control. Recent engine service and bottom paint in January 2018. She is loaded with options including Sea keeper GYRO stabilizers, Hydraulic lift, teak decking, SAT Direct TV, Crew cabin, Raymarine electronics, wood flooring and Hard top with opening roof. Boat shows well and ready to go cruising this summer. Call for more details and to make an appointment to get onboard now. Currently located in Naples, Fl.